Born into the leading family of Rome in 10 BC, Claudius seemed ill-favoured right from the start. Afflicted by disabilities and a bad stutter, he was an embarrassment to most of his family and kept out of the public eye for most of his life, weathering several personal tragedies and busying himself with his writings. Being discounted as an idiot by his relatives in power allowed him to survive several deadly purges and eventually rise to the position of emperor by default, everyone else being dead. 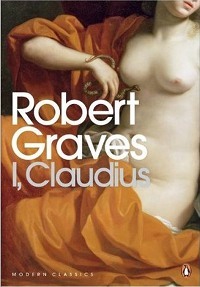 I, Claudius by Robert Graves is an historical novel that proports to be the secret autobiography of Claudius from his childhood up until his surprising assumption of power. Grave's Claudius states up front that he is writing a true history for the ages that will not be found for hundreds of years so he can include information that is damaging to either his family or the political body of the empire. Claudius was apparently a keen student of history, and this is reflected in the clear, dispassionate narrative that Claudius/Grave weaves around what must have been stressful times for the protagonist. This book is a treat for fans of irony. Claudius himself harbours republican sentiments, but ends up being made emperor and dictator-for-life pretty much against his will when all he really wanted was a quiet life away from the limelight with his writings. As a fan of history, Claudius recounts a conversation as a young man with two famous historians about the merits of writing entertaining histories that contain inaccuracies, or dull and/or unpleasant histories that contain only the truth. Claudius states he sides with the truth but the whole passage is an invention of Graves, who was of course writing an entertaining novel. Grave's matter-of-fact style makes for a slightly dry read, but the story is well-told and the characters that swirl around Claudius are so larger-than-life that it is hard to put the book down. Highly recommended.